'CLEAVER: RISE OF THE KILLER CLOWN' is a prequel to 'SLASHER HOUSE', another Mj Dixon directed film. Early 1990's and Clayton Layton is down on his luck after losing his job and having to resort to becoming a clown at kids party. After a drinking session at the local bar he comes home to find his wife being screwed by another guy. As you would imagine this doesn't sit well with Clayton and he goes back out and dons his clown costume and we are welcomed to Cleaver. Back inside he soon dispatches of the guy and the cheating wife, of course the police come to save the day but it is too late and he escapes. Jump to 1995 and he is back in a different town up to the same old stuff, killing and slicing his way through the town to get to a child. Of course it is Halloween and there is a babysitter and the police that are going to stop the killer are too late...heard of all this somewhere before? Well as you can tell the film is very much a 'HALLOWEEN' wannabe with its story line and obvious musical cues from John Carpenter. Although the character of Cleaver is great he just doesn't have enough presence in this film to make you care and becomes a forgotten entity, unlike his appearance in 'SLASHER HOUSE'. It isn't the best film by Mycho Entertainment but it does have their style of lighting which helps it stand out and it does have a few laughs thrown in. Also stay tuned through the credits as there is not one but two little surprises. 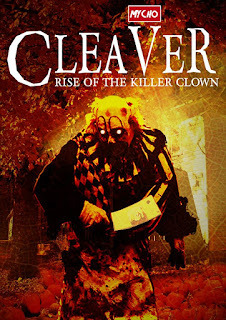 Get your own copy of 'CLEAVER: RISE OF THE KILLER CLOWN' direct from Mycho Entertainment here.